I couldn't have asked for better weather for the Easter break. It got increasingly warm and sunny over the course of the weekend. And the daffodils are finally starting to open - a full month later than the earliest I've seen them (in 2012). I think they're a bit shorter than normal, too. The last of the ice melted from the lake on Saturday (April 19th) - definitely the latest we've seen it still frozen. I spent the whole weekend either cooking or gardening. All the tomatoes and peppers were transplanted into pots in the greenhouse (208 tomato plants and 34 peppers this year) and I dug dandelions by the dozen out of three of the vegetable beds. 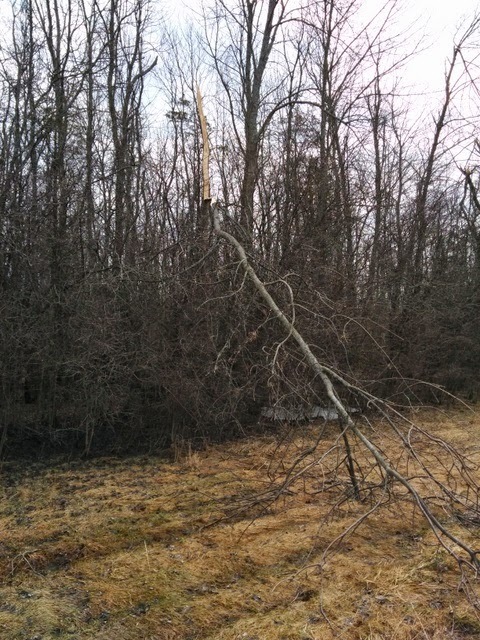 I think Mike is going to be busy with his chainsaw when the ground dries out! I seem to have more memories of childhood Easters than I do of Christmases, for some reason. Like the time I left an Easter egg on the living room windowsill and it melted into a puddle. Mum put it in the freezer and I remember sitting in the garden the next morning, nibbling on frozen chocolate, thinking it was much nicer than the egg would have been. Apart from hot cross buns on Good Friday, I don't think we had any particular food every Easter. Except various forms of chocolate, of course - the children at school would brag about how many eggs they'd received. Easter eggs don't seem to be as much of a thing over here, although chocolate certainly is. My aunt sent us an Easter parcel with some Cadbury's mini eggs in it and they brought back a vivid memory of a cake my mother made one Easter. It had a bird's nest on top, made out of Shredded Wheat coated with chocolate, and a clutch of mini eggs in the middle. I don't have any Shredded Wheat, but I did have some chow mein noodles which I thought might work just as well. I melted a bar of 85% chocolate with about 50g of butter and a tablespoon or two of honey, then stirred in the noodles, breaking them up a bit. I used my crumpet/egg rings as moulds for the nests (on a baking sheet covered with parchment paper) and piled the chocolate-covered noodles into them. I used the handle of a wooden spoon to make a bit of an indentation in the centre of each nest, then refrigerated them for a couple of hours until the chocolate had hardened, Then I removed the rings and put the mini eggs in the centre. We were promised rain today and my gardening plans were suitably modest - maybe sowing a few seeds in the greenhouse. But instead, the day proved to be gloriously sunny and warm and for the first time in six months I was able to get some work done outside. 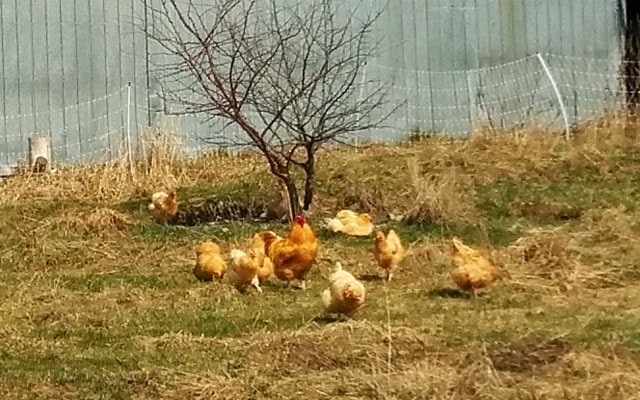 The chickens seem to be enjoying being out again after months of unusual captivity. I never bother to cut down the old asparagus ferns in the Fall because a) I'm lazy and b) I kid myself that they give the asparagus roots a bit of extra protection in the winter. But that means that I have to do it in the Spring and today seemed like the perfect opportunity, given the unexpected window of lovely weather and the disappearance of most of the lingering snow. 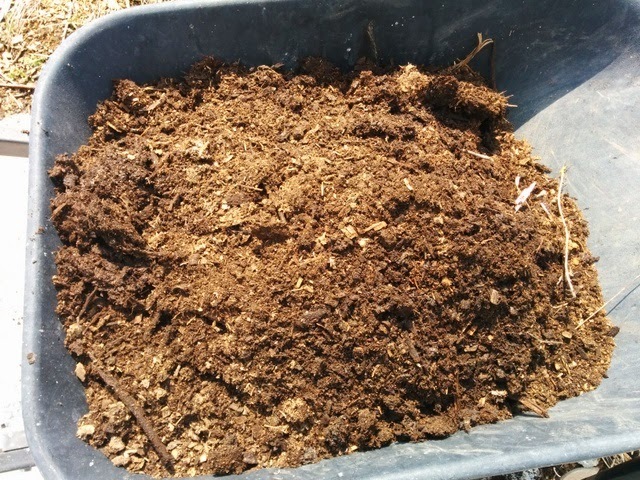 The last stage in the process was to add a top-dressing of well-rotted chicken manure. This is the batch-before-last, probably the one I made in 2012. It's lovely now - all crumbly and soft and full of insect and (I presume) microbial life. 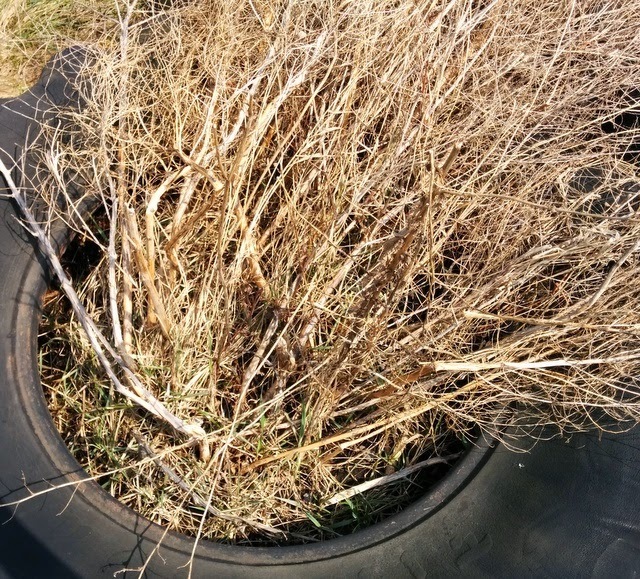 My rhubarb plant from 2008 is also in one of these tires and is just starting to produce buds. 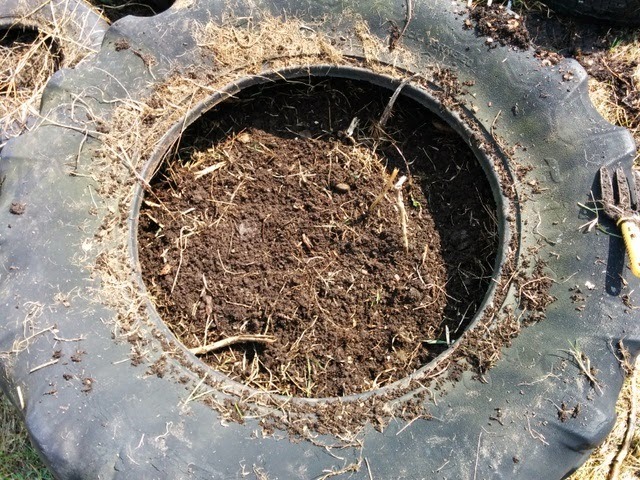 I dug it up, split it in two and replanted half in the old tire and half in a spare one where one of the other original rhubarb plants hadn't survived. They got a shovelful of chicken-litter-compost over them, too. By the end of all that I was exhausted and extremely warm. I'd almost forgotten what it felt like to feel hot outside! The snow is melting away in a sometimes unpredictable manner. Lumps are left behind here and there, like a man who hasn't quite rinsed off all the shaving foam from his face. The gate is finally clear of snow, although the lake you can glimpse in the distance is still frozen. In places, the remains of the snow drifts create artistic cliffs above the fast-flowing meltwater. Usually there are huge sheets of ice at this time of year, but all the snow has stopped much from forming around the stream this winter. It's certainly been an interesting season, but I'm not sorry to be seeing it leave! And last year set a record for us in lateness of flowering for them. 2014 looks like it might top that! The average temperature in this area for March is -1°C (30°F). This year we've had an average of -5°C (23°F). But, hey, I can finally see the daffodils, so at least things are improving!